Here are photos of some of our favorite food microbes. If you’d like higher resolution images for printing or use in publication, please email Dr. Benjamin Wolfe. This crazy looking colony is the bacterium Staphylococcus xylosus. 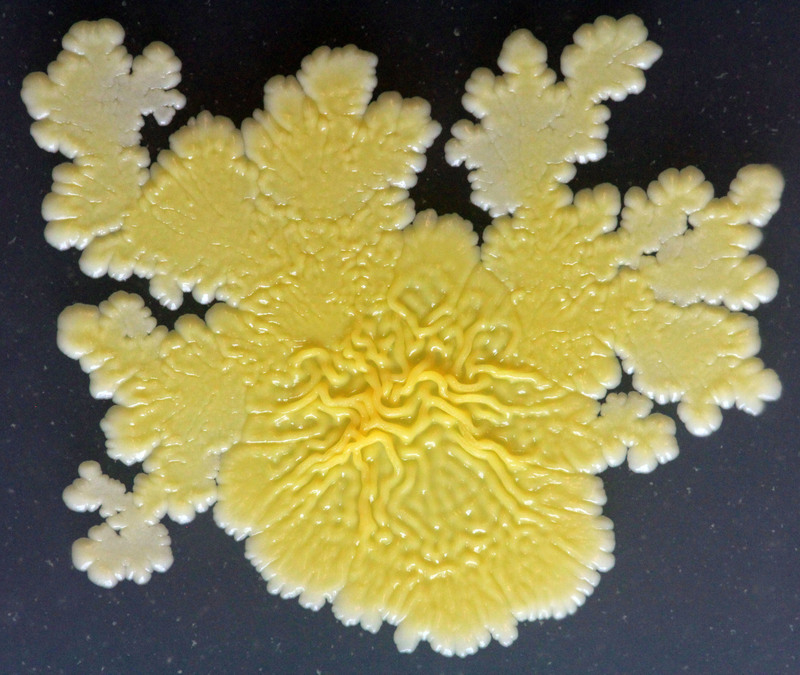 This coagulase-negative Staph species is commonly found on fermented dairy and meat products. The wild patterns forming at the edge of the colony are a common trait of Staph and we think play important roles in how this bacterium moves through microbial communities. A collection of yeasts in the Saccharomycotina (a subphylum of fungi) that grow in foods. I love this photo because it shows you just how diverse yeasts can be in appearance, but also how they play imporant roles across food systems. Large fuzzy beige colonies (two top left and one on the right) are Yarrowia lipolytica, which is commonly found in bloomy rind cheeses. The large fuzzy colonies (center and bottom right) are Galactomyces geotrichum (aka Geotrichum candidum), which makes the wrinkly patterns on bloomy rind cheeses. Smaller and wrinkly edged colonies that are somewhat transluscent like jelly fish (like in bottom left) are the yeast Zygosaccharomyces rouxii, which plays important roles in flavor production of soy sauce, miso, and some balsamic vinegars. The very white, small and smooth colonies are Debaryomyces, which can be found in cheeses, fermented meats and many other fermented foods. A mix of bacteria and fungi isolated from the rind of a blue-cheese aged in Vermont. 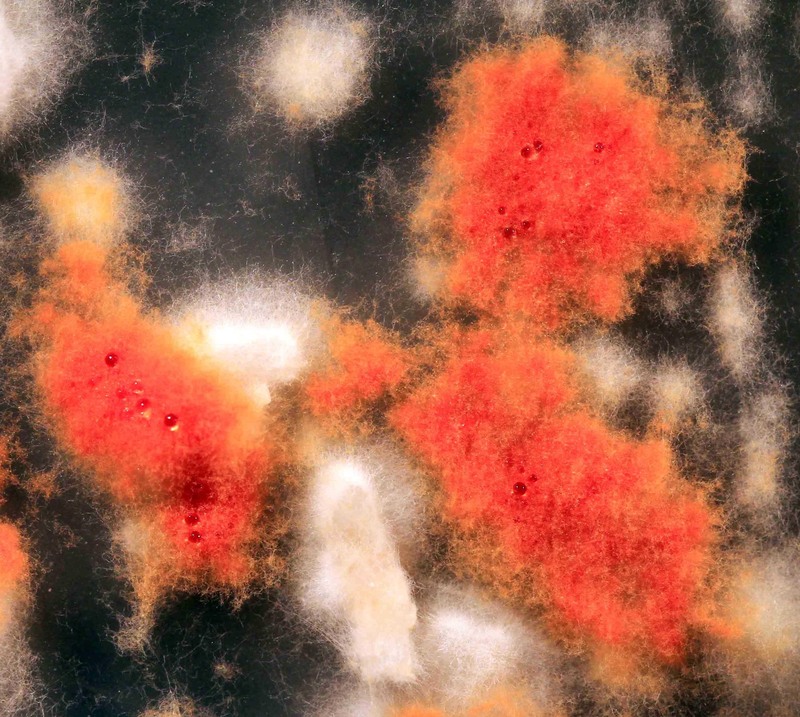 The wrinkly, orange colonies are Staphylococcus xylosus, the white and wrinkly colonies are Staphylococcus succinus, Smaller round and orange colonies are Brevibacterium species. The fuzzy mold is a Penicillium species. The mold Sporendonema casei, which commonly colonizes the surfaces of natural rind cheeses.